Sheila has been deaf for 30 years, she lost the hearing in one ear when she was a child, but was not diagnosed until her teenage years. She has used her own experience to support others both personally and through raising funds for charity. Her attitude and commitment has inspired her husband John to equally devote his time and efforts to improving the lives of deaf people and their families. They have raised hundreds of thousands of pounds for charities such as Hearing Dogs for Deaf People and Peterborough and District Deaf Children’s society (PDDCS). 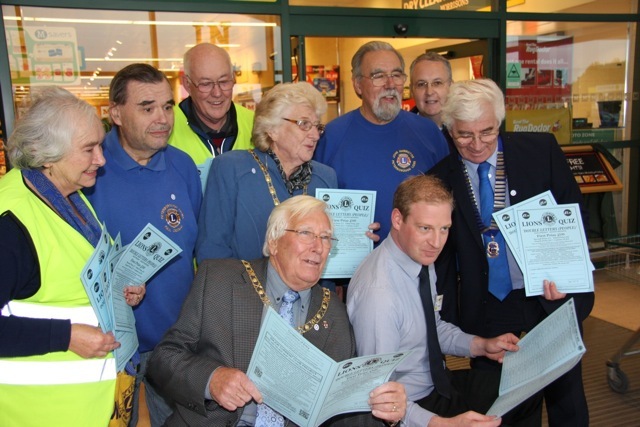 They also devised the highly successful and popular annual Peterborough Lions Quiz. 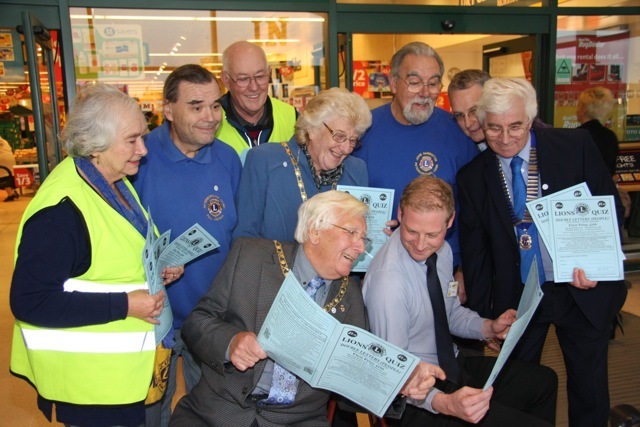 Together, Sheila and John have delivered training in Deaf Awareness and face reading to organisations nationwide in their role as Speech and Hearing Officers for the Lions Club International. They also created the “I see what you’re saying” badge. 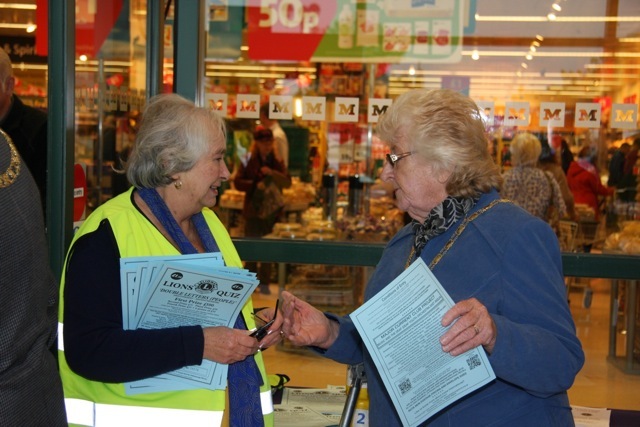 Now retired from work, Sheila and John continue their hard work to promote a positive attitude towards deafness. With their warm personalities they make others feel that anything is possible. 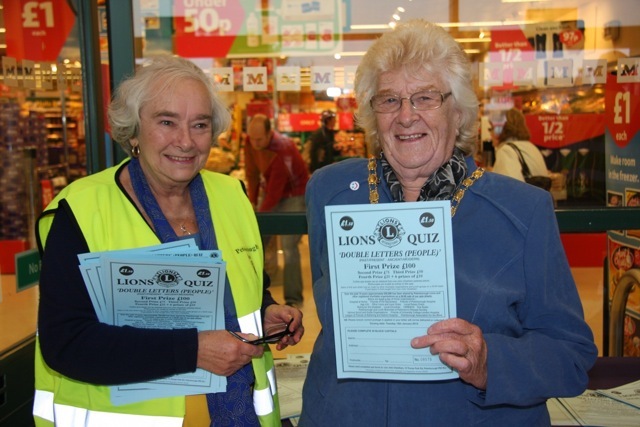 September is here, which can only mean one thing: 2014’s Peterborough Lions Quiz is here! 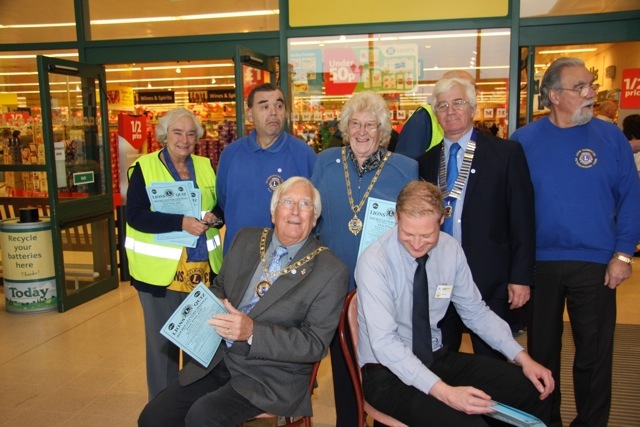 As usual you’ll be able to pick up a copy from one of several local shops and charities (if you’d like to support us by selling the quiz please get in touch), or directly from us in person at one of several locations throughout the city over the next couple of months – check out our diary for locations and dates. You can also buy them online (£1 postage charge applies no matter how many you buy, and we still have some of last year’s available if you missed it). This year the theme is “Equine Antics (a saddlebag of horsey questions)”, so if you know your Shetland ponies from your shire horses you should have an advantage – but if you don’t, not to worry because the connection to horses is pretty loose, and as usual it’s all a bit of fun (horseplay?). The price is unchanged from the last couple of years at £1.50, and you can win prizes of up to £100! 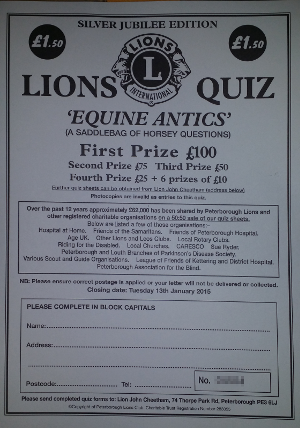 For those of us who have been around a while this might not come as a surprise, but can you believe that the Peterborough Lions Quiz has been going for 25 years? That makes this our silver jubilee! The quiz was devised by Peterborough Lions John & Sheila Cheetham, who both remain valuable club members all these years on and are now nominated together for a community award. 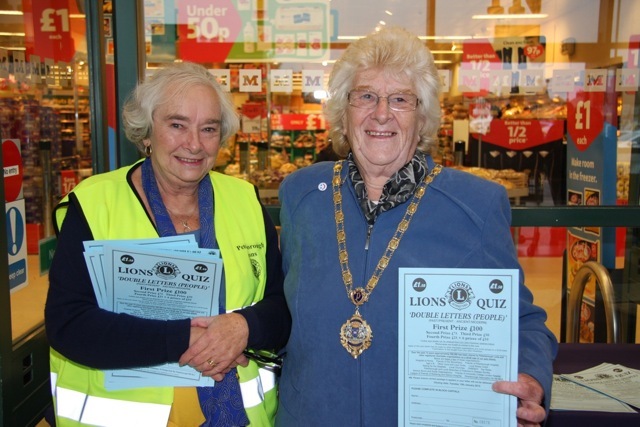 If you love the quiz please take a look, and vote for Lions John & Sheila! A huge thank you to everyone who bought our 2013 quiz – a huge success and a credit to everyone who took part. 1st Prize – D Blundell, Moulton. 2nd Prize – R Dawson, Peterborough. 3rd Prize – W Parsh, Ramsey. 4th Prize – M Bielby, Leeds. 5th Prize – C Pairman, Falkirk. 6th Prize – B Dawson, Peterborough. 7th Prize – D Mundin, Northampton. 8th Prize – J Heath-Brown, Market Deeping. 9th Prize – J Edwards, Brighton. 10th Prize – C Roper, Northumberland. So that’s it for the 2013 quiz! Take the next six months off to relax and prepare yourself for the 2014 quiz, available from September. 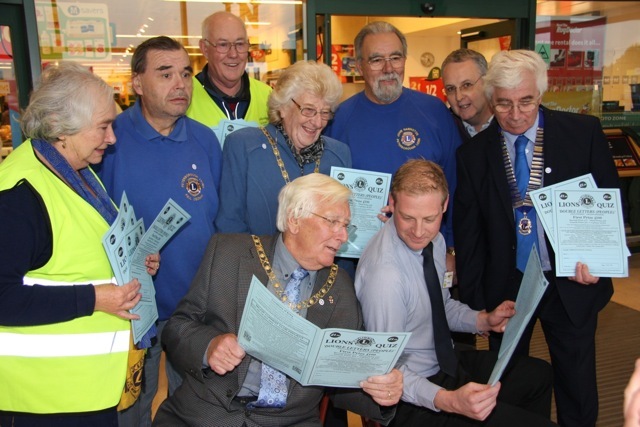 Peterborough Lions Quiz – marking is underway! We’ve had hundreds of completed quizes returned to us this year – thank you to everyone who bought a quiz leaflet for your support! n now is how many of those completed quizes have the correct answers, and who will win the prizes? Marking is underway, and the answer list is growing as we discover the perfectly valid answers that people have come up with that we’d not thought of ourselves… As long as the answer is valid (on which the quiz organisers decision is final, of-course!) we will accept alternative answers so don’t worry if your four letter answer to “small stream” is different from ours! Once the quizes have been marked and a final set of acceptable answers has been reached, we will have a draw for the winners and the prizes (and answer sheets) will be winging their way out to people. The draw will take place at the club’s February business meeting on Tuesday 11th Feb. For anyone who sent us a stamped envelope for an answer sheet, we expect these to be posted out on Thursday 13th Feb so you should receive it shortly afterwards. If you missed the quiz this year, it is still available to buy online although of-course it’s now too late to enter to win a prize. It is however still great fun and the £1.50 donation to charity will be put to great use. The quiz has been one of our main fundraising activities for over 20 years (the club itself being over 40 years old, over which time it has collected and distributed half a million pounds to local charitable causes). Additionally, the quiz has helped several local charities and other voluntary groups raise over £50,000 by selling them on a 50/50 basis through charity shops, church halls, scouting venues, etc. As Mayor of Peterborough, “Lion June” is not able to attend many Lions’ meetings or events but is keen to promote our efforts to raise funds, with the focus this year on a bladder scanner for Peterborough Hospital and amenities for Phoenix Special Needs School, alongside a myriad of smaller commitments, and Peterborough Lions Club is proud to have the current mayor as one of our members. Peterborough Lions Quiz – Buy Online Now! For the first time ever, our Quiz is available to buy online! If you don’t get chance to come and see us to buy one in person – or you bought one already but want more – you can now buy them directly from this website. The quiz costs £1.50 each, and as well as giving you several hours of entertainment and helping us raise funds for great causes around Peterborough and further afield, you also stand he chance of winning up to £100 in prize money! Simply click the Store link in the menu, and buy as many as you like for a fixed £1 delivery and handling charge. Payments (by credit or debit card) are taken on our behalf by PayPal so you can be sure your card details are safe. Peterborough Lions’ famous (infamous?) 2013 quiz leaflet will shortly be upon us – are you ready? 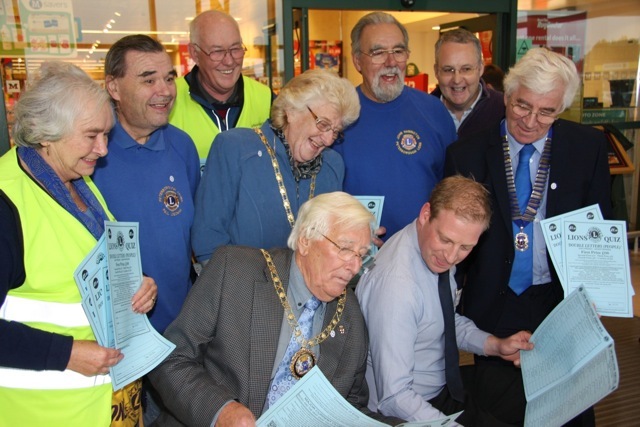 Don’t forget that as well as being a lot of fun, the Peterborough Lions Quiz is one of our most successful fundraising activities each year, so please give us your support! If none of those dates suit you please get in touch and we’ll do what we can to sort something out. 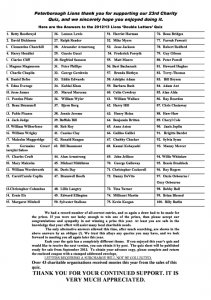 It seems a very long time since the first 2012 Quiz Leaflet went out, but we can now give you a list of the winners and the answers. 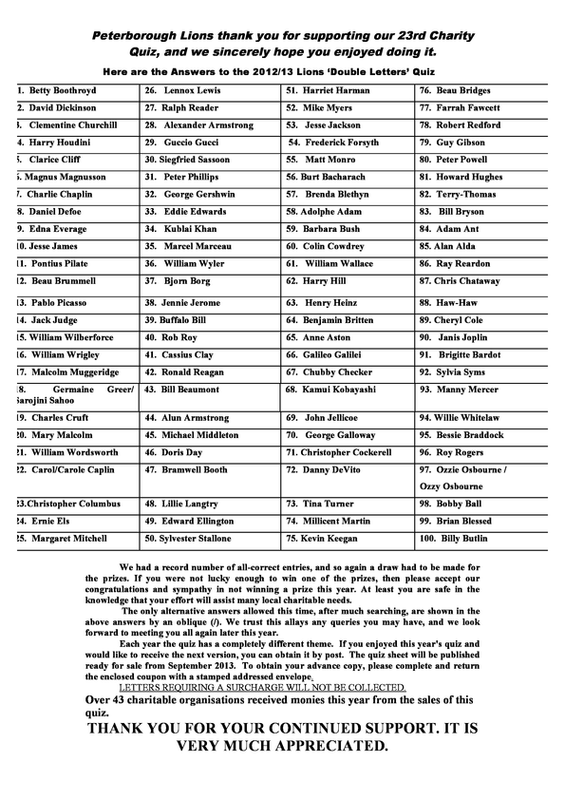 Thank you to everyone who took part, and well done to everyone who got all the answers right whether or not you were fortunate enough to win a prize. Many people told us we’d made it too easy this year, and the number of returned sheets was indeed very high. Others told us they found it quite hard, and maybe the high number of completed sheets we received that turned out to have wrong answers on them bears that out too (we had 1475 returned, of which only 52 were correct, so if you completed yours but didn’t send it in you might well have missed out!). Either way, we hope everyone enjoyed the challenge and will be looking out for the new Peterborough Lions Quiz later in the year. Thank you Peterborough, and well done all! 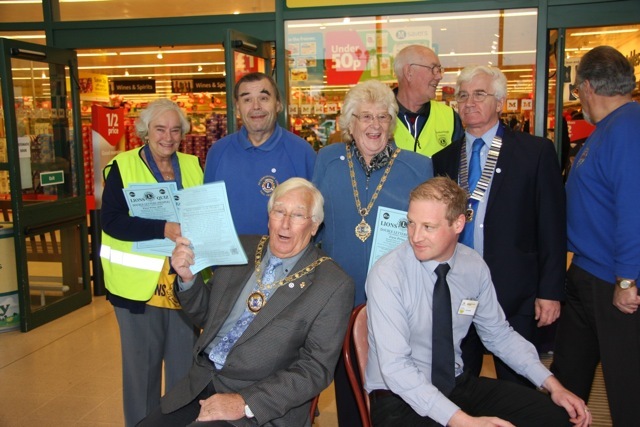 We were pleased to meet Peterborough’s Mayor and honorary Peterborough Lions Club member Councillor George Simons at Morrisons on Lincoln Road on Friday 5th October. 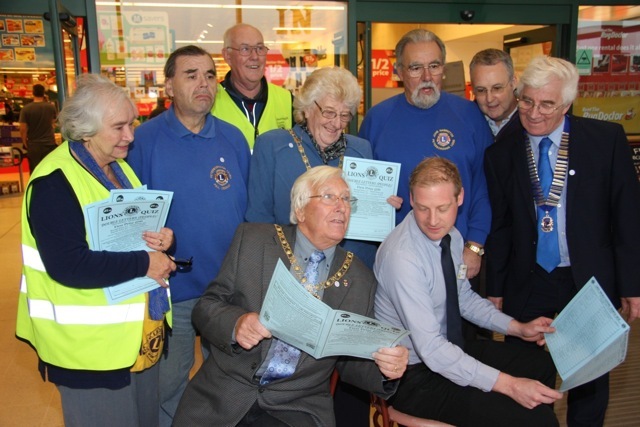 Special thanks go to Andy Haigh, the store manager, who was on hand to swap answers with the Mayor and Mayoress and the Lions who were present. 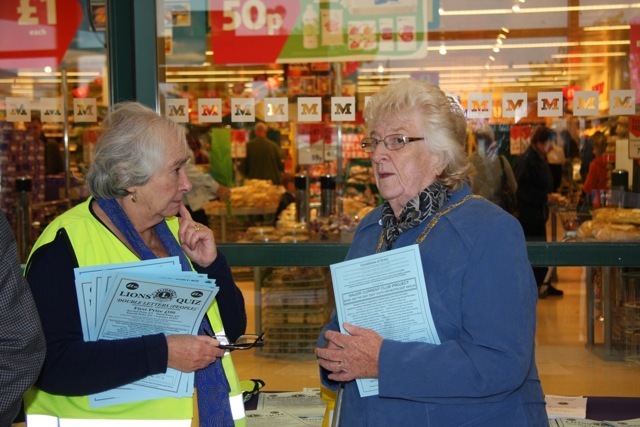 Quiz leaflet sales continue at Morrisons in Stanground on the weekend of 20th/21st October. If you’ve missed the quiz so far, please contact us and we’ll be pleased to find a way to relieve you of your £1.50 for great local causes (and you’ll get several hours of brain stimulation into the bargain!) This year’s major project is the East Anglia Deaf Youth Orchestra with Music And The Deaf.